The pattern for Elefante is finally here for the taking. This pattern came to be when a knitter emailed me after spying a tiny striped elephant on a shelf in Itty-Bitty Hats on page 18. She wanted to know where to get the pattern. I had no idea where that elephant came from until a friend (thanks Renee) told me about this site. I am sure the original is a crocheted toy from this site and boy oh boy, are the other toys available here ever cute. I decided to make a pattern for a knitted version of this little guy and share it with you here. Have fun and please let me see your finished Elefante! Warning: Please be sure to use your discretion when using poly-pellets for filling your knitted toy. If your elefante is intended for a baby, please be sure to not use poly-pellets or make a muslin bag to hold the pellets before putting them inside the elefante. The other option is to only use the fiberfill to stuff the toy. The pellets would be considered a choking hazard for babies and toddlers if they leak through the fabric. 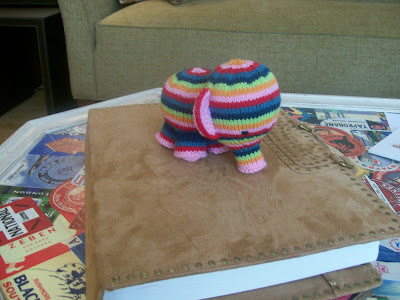 My elefante is knitted with a tight, dense fabric that holds the pellets inside and it is not for a baby, it's for me! Enjoy. Tip: Since this is a stuffed toy and the inside will never be seen, I cut and tied the ends of the different colors on the inside as I worked. This will hold together better because toys are often pulled and squeezed by little ones, at least I hope so! Don't worry about the ends is what I am trying to say and go ahead and tie some knots! Really! m1 create a new stitch by placing the bar in between 2 stitches on the left needle from front to back, then knit it through the back of the loop. With Dark Blue cast on 21 stitches and place 7 stitches on each of three double-pointed needles. 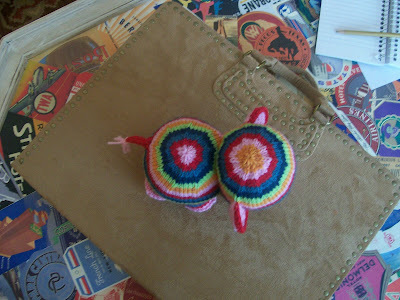 Join to knit in the round and place a marker on the first stitch also being careful not to twist the stitches. Knit every round working 2 rounds of each Dark Blue, Light Blue, Red and Pink. Cut the yarn and place on a yarn needle. Pull through the remaining 9 stitches tightly to close the hole. Weave in the end to the inside. Pour poly-pellets in the leg to about half full, fill the rest with the fiber fill. The top of the leg remains open. Set the legs aside for now. Working in the stripe pattern beginning with Red, cast on 9 stitches with 3 stitches on three double pointed needles. 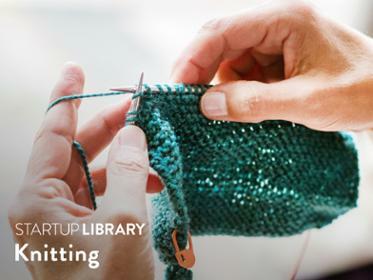 Join to knit in the round, placing a marker on the first stitch and being careful not to twist the stitches. Place a marker on a Rnd 6 stitch. This will be used for measuring in a moment. Continue in the stripe pattern and knit straight for 2 1/2 inches from the stitch marker you placed on Rnd 6. Now begin the decrease rounds. At this point, tightly close the hole on the bottom of the body where you cast on with a yarn needle and matching end of yarn. Now fill the body first with the poly-pellets to about 1/3 full. Fill the rest of the body with the fiber fill up to where you are working. You need to add more fiber fill as you finish up the body before closing the hole at the top. Cut the yarn and thread onto a yarn needle. Complete any remaining stuffing at this time. Pull the end through the remaining 9 stitches and pull up tight. Weave in the end to the inside. This end is the top of the body. Take the four completed and stuffed legs and whip stitch the legs to the bottom side of the body. With Pink cast on 9 stitches placing 3 stitches on each of three double-pointed needles. Join to work in the round, placing a stitch marker on the first stitch and being careful not to twist the stitches. Switch color to orange and continue in the stripe pattern as set. Knit every round until the trunk measures 1 1/4 inches from the purl round (rnd 4 of the trunk). Now you will start increasing to form the head. 54 stitches total are on the needles. 60 stitches total are on the needles. Knit every round straight until the head and trunk measure 4 1/2 inches from the purl round of the trunk. Now you will start the decrease rounds for the top of the head. You may have to do some redistributing of the stitches as you work for the decreasing. At this point close the hole tightly on the bottom of the trunk with a yarn needle and end. Fill the trunk with poly-pellets and then fill the head with fiber fill up to the working round. You will need to continue stuffing the head as you complete the head. Cut the yarn and thread on a yarn needle. Pull through the remaining 10 stitches. Complete any remaining stuffing and pull up tight. Weave the end to the inside. With Pink and the crochet hook chain 4, join in a ring with a slip stitch. Rnd 1: single crochet 8 stitches into the center of the ring, join with a slip stitch. Rnd 2: (1 single crochet, 2 single crochet into next stitch) repeat across, join with a slip stitch. Rnd 3: (1 single crochet in the next 2 stitches, 2 single crochet in the next stitch) repeat across, join with a slip stitch. Rnd 4: (1 single crochet in the next 3 stitches, 2 single crochet in the next stitch) repeat across, join with a slip stitch. Rnd 5: (1 single crochet in the next 4 stitches, 2 single crochet in the next stitch) repeat across, join with a slip stitch. Cut the yarn and pull through the last stitch. Fold the ear in half. With Red and the crochet hook, single crochet the edges of the folded circle together. Leave the folded edge as is. Cut the yarn and pull through the remaining stitch. With a yarn needle and Pink whip stitch the ears to the head using the photos as a guide. Make straight stitches with a yarn needle and black for the eyes again using the photos as a guide. With 2 double pointed needles used for knitting an I-cord and Red, cast on 4 stitches. Knit an I-cord for 1-inch. Bind off. With Pink make a 1-inch tassel with 8 wraps. Sew onto the end of the tail. Sew the tail to the backside of the body. I know this pattern is a little quirky at some points, but this is simply what I did to make this little guy. I hope you enjoy the pattern. Please be respectful of copyright issues. This pattern is for personal use only and is not to be sold under any circumstances. 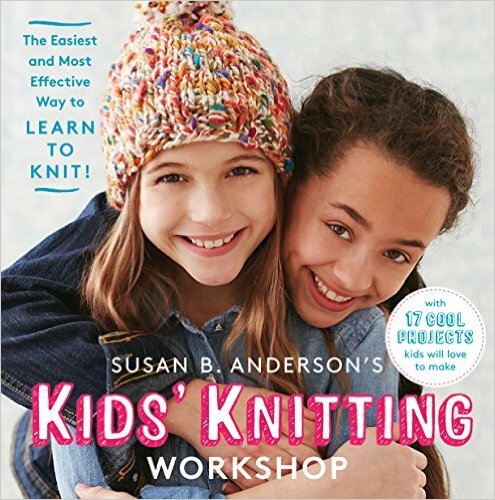 The pattern is also not to be used to knit and sell the finished item. Charity knitting is always welcome along with the use of this pattern. This is so incredibly cute! Thanks for sharing. Well Done!! what a cute elephant. I am still trying to work out the pattern from the picture in the book. I am the knitter that emailed you about the elephant in your book and have become obsessed about elephant toys every where now. I knitted the elephant out of Zoe Mellors knitted toys book but it doesn't compare. I can use your pattern to help me finish of my elephant that I have been making up as I go along using the picture as reference. Thank you soo much for the pattern. Thanks for sharing the pattern. That is the most adorable elephant ever! I have to make one for myself, it's THAT darned cute. It just makes me smile. Thanks for sharing! oh my gosh your stuff is SSSOOOO adorable! This is the cutest thing I have ever seen! I came across your site quite by accident. 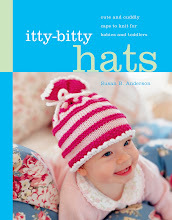 I had you book and my sister-in-law had selected so many of the hats as "requests" for me to knit for my niece and nephew. I saved the link for the elefante pattern just in case. Well, one day last week my niece (3 years old) announced she wanted a red elephant like Max had in the kid's show Max and Ruby. My sister-in-law said to me, "Where am I ever going to find a red elephant?!" I was proud to announce that I had a pattern and would make it. He came out SO CUTE and I am so happy with it. I can't wait to see my niece's face when she sees her new friend. THANK YOU!! Hi, I LOVE this elephant. It's so cute. My best friend since kindergarten is pregnant and she's always collected elephants, so I was on the search for an elephant pattern. I am new to knitting, but pretty good at learning as I go. I am having some issues going from the listed rounds in the leg to closing it up. I think I'm just a bit confused by what you mean in the pattern. If you could help me out, I'd greatly appreciate it. First I want to say that I LOVE this pattern. Im making one for my cousins new baby and another for a christening present. The pattern was fairly easy and didn't take me very long to complete and I'm only 16. But the one thing I'm having trouble with is the ears. I'm not a great crocheter, so if you could give me like easier directions or simpler steps that would be amazing. thank you so much! if you could email me at Shelbymac65@yahoo.com that would be amazing or whatever is easiest for you. Thanks again!! OMG! You are so generous to post this pattern. Thanks. It's just adorable. That is a problem. There are two things you could do. Make another one and use stuffing only, no pellets, or take apart the one you gave for a gift and take the pellets out. Or there is one more thing, if you still want to use the pellets, you can make a muslin bag to place inside, say the body, of the elephant with the beads inside and then stuff with fiberfill. My knitted fabric is so tight that none of the pellets leak through and I didn't give it to a baby. These are important things to consider. If your stitches are looser and it is intended for a baby, definitely don't use the poly-pellets. The pellets can be a choking hazard for babies and toddlers so be careful. I love this little guy. Is there a way you could post your pattern as a PDF to download? I had trouble printing it from your blog page. Thanks! IS there a printer friendly version ? Thank you so much for sharing this pattern. I just finished knitting the elephant and I am now working on the ears! I love the elefante! But i cant nit or sew a thing! Im such a cluts and was wondering if you would be interested in selling one? I know my little lily would love one! She just turned one and if you are interested could you email me at anna.olivo@yahoo.com to discuss how much you would like for her. Thank you for sharing the patter for this adorable Elefante. I will try to make it for my friend's baby, and I cannot lie, for myself also. I have to have one of my very own. Soooo cute. im looking for my first independant pattern but do you think that this could be too hard, i'm 13 and can knit & crochet quite well but im not sure. Go for it! You can totally and completely make this elephant. 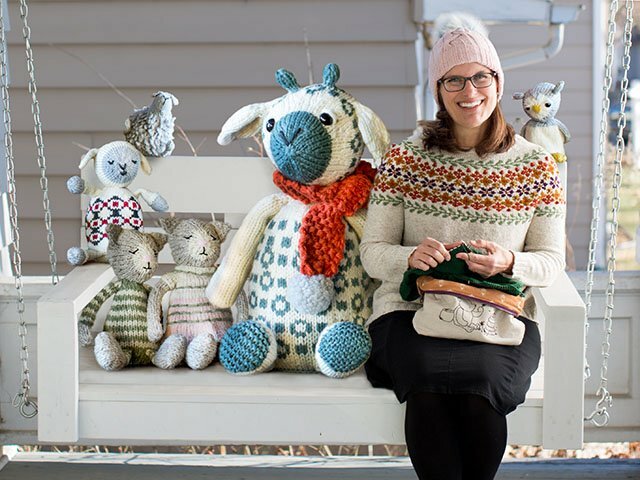 Please do a knitalong with Elefante, that would be so much fun. Keep me posted on how it goes and good luck! I absolutely love this pattern! I know it says that charity knitting is okay, but I like to double check. We are having a silent auction at my work for Heroes at Home and I planned on making one of these. I hope that's alright. Thanks for sharing! That is THE cutest thing I have ever seen! Have Casscade 220 bits to use up!Will knit! OMG! I love this little guy! Thank you so much for the pattern! I really have to knit it!!! to fill elephant with pellets place them in pantiehose cut in a circle and gathered at top. i love elephants,i live in a small flat and am forever knocking them over,they dont' seem to mind tho.I live in a small town,Broken Hill,N.S.W, Australia. we have no craft shops so i love this internet. I love the elephant and the pattern! Easy to follow, and I'm not used to knit "in english". Finnished my first of many elephants today, just posted at couple of pictures in my blog (wich is in Swedish, but you can always look at the pictures). I excluded the pellets, but put a big glass-marble in it's body to get it a little bit heavier. Just finished my Elefante, I'm going to be putting pictures on my blog tomorrow, but for now I just wanted to thank you so much for putting up this pattern! I wanted to make him so much that I actually learned to knit on 4 needles just to make him!! This is the cutest of all possible cute things! I made the ears slightly differently than the directions indicated, but otherwise followed exactly to make a sweet pink-and-purple elefante for my niece - it's sure to be a big hit! Thanks for this free pattern, Susan. I finally made it and love, love love it so much that I will make more. The first one is here (http://www.ravelry.com/projects/Jhocy/elefante) which is for my 6-year old son. What a cute elefante. What does your new book include for animals? I would like the pattern for the bear on your dedication page in itty bitty hat book. 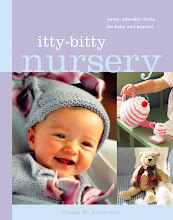 The pattern for the bear on the dedication page of Itty-Bitty Hats is included in my second book Itty-Bitty Nursery. Hi! I'm italiaan and have a blog where I had spoken about you! 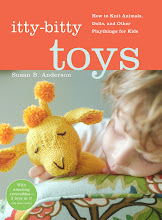 I just bought the toys book, and wanted to tell you how much I love all the projects in it! I don't know which one to start with. Bravo! SOOOOO adorable! Love the colour pattern you used. Oh he is adorable, thank you for making the pattern free. Thank you so much for this pattern! Just finished one for a friend's baby. You can see it at http://www.ravelry.com/projects/bellymonster/elefante It's pink, white and lilac for a little girl. I'm officially in love. I can't wait to start working on him! 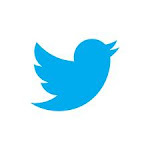 I'll send you a picture as soon as i finish! I don't know what it is about baby elepants, but they are sooooo cute. 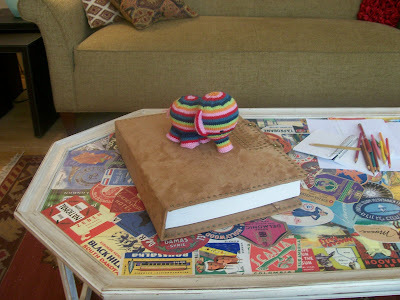 You did a great job on "Page 18 Elefante," and I want to thank you for sharing the pattern with the rest of us. oooh! I'm just dying to make this little guy!! 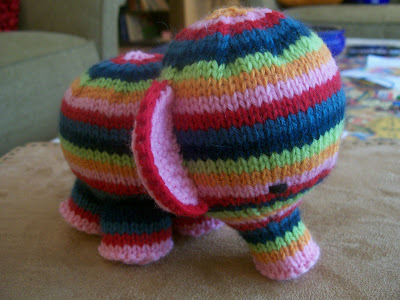 As soon as I'm finished with my current project I will be making this elephant! I've been looking for a good elephant pattern! I can't wait to make one. I'm in the middle of making this! Its my first attempt at knitting on dpn's and it was going so well until i realised that my head is WAY bigger than the body. I'll keep trying though! is there any way to knit the ears? If you look on Ravelry there are tons of knit ear patterns for Elefante. I can't find where it tells how to join the head to the body. Am I missing it somewhere? Or is it just as simple as eyeballing it and stiching them together? 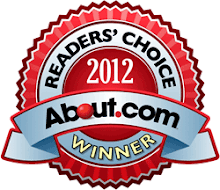 you are awesome, thanks for sharing this with us! i love you elephant so much!! i will make that elephant i'm sure.. i hv to!! i gotta hv that!! i always love elephant dolls!! n this will make it to my top 5, definitely!! I saw your link on a friend's Facebook picture. :) This is soooo adorable!!! Nicely done!! I love it love it love it!I cant wait to dig out all My spare yarn n get started.I have to say I really like how You layed out the pattern and added soo many pics.Not many people do so. Thank U a great deal! this is the cutest little elephant I ever saw. My daughter (3y) ordered me one for her and one for her sister (15months). I really enjoyed making Elefante and my hubby too! I used a wool soy blend with tans and browns and blue and some charcoal and black. I ran out of yarn by the time I got to the ears so I am going to use eco duo by cascade yarns. It's ears will be the softest ears ever. Thanks your pattern was amazing! 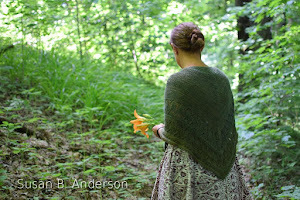 Can you use mercerized cotton (Sassy Skein) yarn for this? (Trying to use up my stash but don't have enough colors in worsted) Also, can you use a larger sized DPN to make a bigger version of him or will that throw off the circular shape? 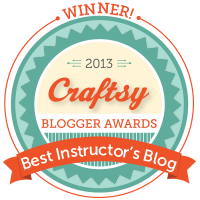 Thanks so much for sharing this pattern! This pattern is great! Really well written and easy to follow. Thanks so much! I am in love with this little guy, my only trouble is with the ears. I can't crochet for the life of me. Any suggestions for possibly knitting the ears? Love this elefante and your directions and generally really easy to follow. I also am having trouble with the ears, though. I'm not advanced at crocheting, but have made some small projects. I'm just having trouble picturing how to do the ears correctly, and my attempts at improv were failures! Would it be possible for you to try to describe it in a different way? Thank you!! This is an amazing pattern. Thank you for making this available to everyone. I haven't made this pattern yet, but I'm thinking about trying it. I don't want to start it until I understand how to join the head and the body together properly, but I can't find that anywhere in the pattern. I was assuming I should just whip-stitch it together, but on the close up view of the head/body connection I can't see a single spot where a color shows up that isn't part of the stripe pattern and in fact, I also can't see any sign of a whip stitch. It looks like the head and body were simply super-glued together. How can you whip stitch something striped together with 1 color yarn and keep it entirely invisible? it's whipstitch to attach the head and legs. i just use the same color to match so it is invisible. Is it possible to complete this project on 4 DPNS instead of 5? I don't have a set of 5 and I was thinking of trying it on 4. This is one of the sweetest toys i have seen. 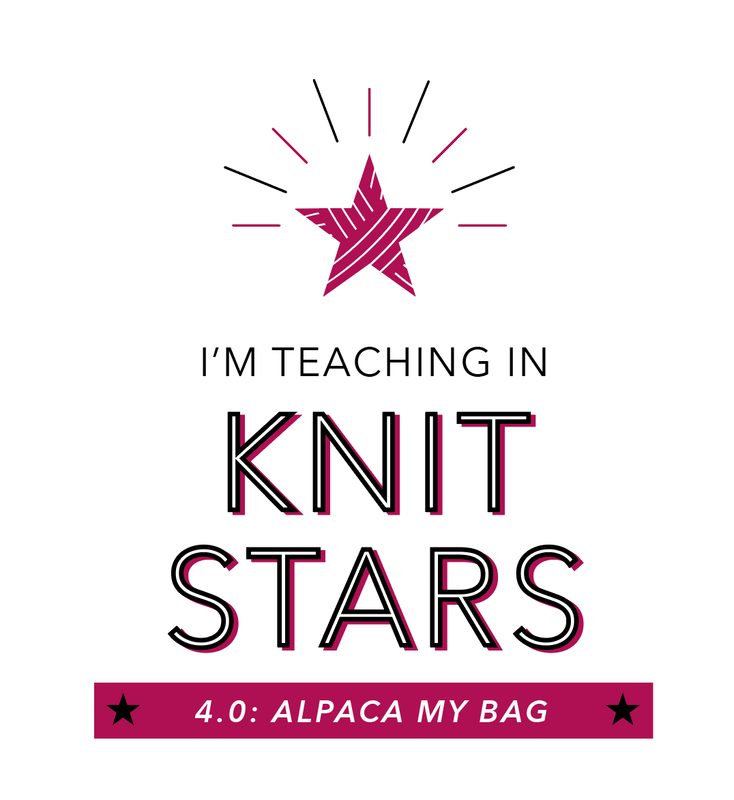 Currently making for a colleague who is going on maternity leave. I am sure both her and the bump will love it. Thank you so much for sharing this cute pattern! Do you sell these?! because id love one! About how much total yarn did you use? I can't work with different colors, so I'd like to know how much yarn I need. Thank you so much for sharing this adorable pattern. This is my new go-to Baby shower gift!! This is so cute! I'm making one to share with a friend who just had a baby! How did you do the eyes though? I don't understand how you were able to stitch them and then tie them off securely since the head is already stuffed. If you could provide more information on this I would greatly appreciate it. Since this is for a little one, I want to make sure that nothing comes loose! Thanks! sanderella, i have an instructional video available on how to embroider faces on stuffed animals, including how to secure the ends. 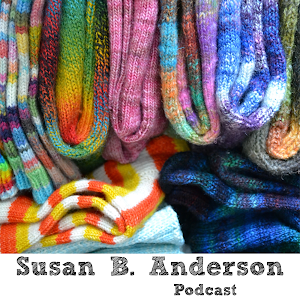 it is on my sidebar and on my youtube channel, SusanBAnderson. Thank you for this sweet elefante! Love your animals. Have your books. Knit for charity. Wonderful patterns. THANK YOU so much for this free pattern! I have all your Itty Bitty Books and wonder about some of the other items in the pics too...lol, I may be asking one of these days. Thank you very much for share this beautiful pattern. I've made one for my little son that loves the elephants. If you want to watch it this is the direction: http://ana-tejeteje.blogspot.com.es/2012/08/de-bombay-porque-esa-es-la-calidad-de.html. This is really cute and I would like to try it - I am more of beginner/ advance beg. using 5 needles intimidates me - will this work with a circular needle? Where is the pdf for this elefante?? I can't find it anywhere. Thank you! Is this right? I understand (k2,m1) 4 times but what is k2? Is it k2,kfb or what? thank you so much for sharing the pattern for this lovely elephant! I immediately had to knit it and my daughter (2 years old) loves it. :) By the way, I only filled it with filling tissue to avoid any problems with the pellets. 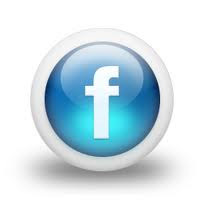 Now I have a question: May I share this with my friends on facebook with a link to your site? This elephant is precious. Thanks for making the pattern available. I am making one for my niece and know she's going to love it. Unfortunately I do not know how to crochet so the ears are posing a problem. 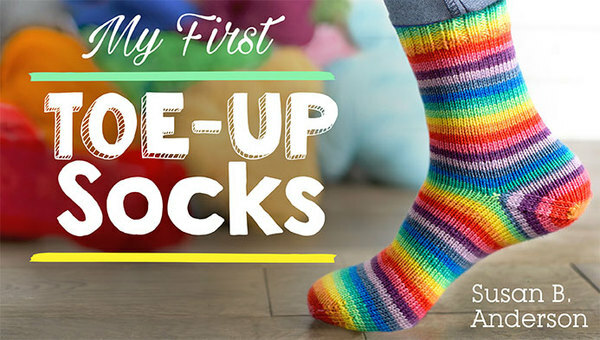 Is there any possible way to knit them? If so could you email me please. 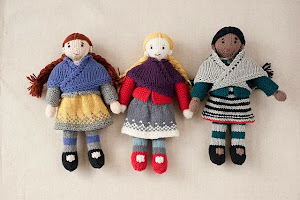 Can i knit any of the itty bitty's using Magic loop? 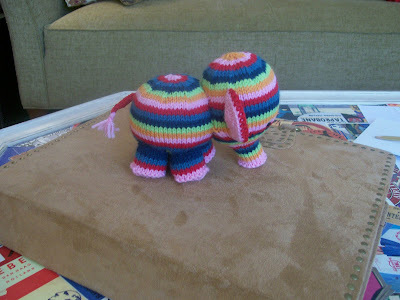 I just knit up two cute little elephants from leftover yarn from knitting the Not So Itty-Bitty Giraffe. Thanks for such cute stuffie patterns! I'm on my third one, I'm making it for my baby due next week, as he's quick and easy he's ideal. I would like to put a little jingle bell inside but worried about choking hazard so maybe not. Great little patten, I'll most likely make more!! This is adorable, Ms. Anderson! Thank you so much for sharing the pattern, that's very generous of you. I love the photos. Would you mind terribly if I used this pattern as a reference to crochet? I can't knit in the round very well, and since this isn't a flat pattern it's easier if I just crochet it. I'm working on this for my 3 year old grandson. He is crazy for elephants! I can't wait to give it to him for Christmas! Its so cute! Hi Susan, what an adorable little elefant!!! I am working him up in a rainbow variagated yarn and so far so good however I am now on Round 7 of the head...a bit confused on your instruction of k2, m1 4 times, k2 across each needle. I am going to assume that you mean to continue building stitches as in earlier parts of this project (kfb???). I'm hoping so since the initial confusion came from the "m1" reference instead of what you'd been using "kfb". Thanks for posting such a cute pattern for all of us to create! I think I'm going to make this elephant with my first handspun! It's not pretty, but it would make a quirky little elephant buddy!it's perfect! Thank you for this cute little animal! He will surely be a friend of mine for a long time. Help? I'm a little stuck on the body. I've done 3 rows / increases in one color, and 3 in my second color ... but I don't understand how much more I should do with each color ... once I get up to the right stitch-count. If I read the instructions literally ... it doesn't seem like it's going to be big enough for the body. What am I misunderstanding? 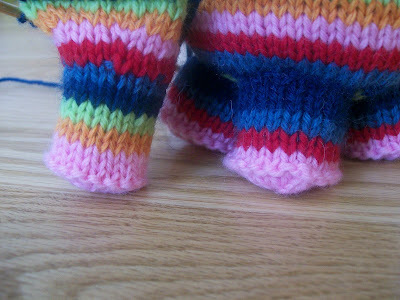 Hi I just love Elefante but was wondering as I am not good using 4 needles, can it be knitted flat and if so, would it be possible to get the pattern please. 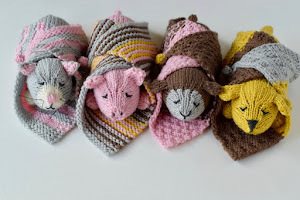 Hi I just love Elefante but as I am not good using 4 needles was wondering if it could be knitted flat, and if so, would it be possible to get a copy of the pattern please? Thanks.